Google Analytics is a great tool if you would like to delve deeper into your readers' behavior. Google Analytics tracks all sorts of interesting data with regard to traffic on your pages, such as visitor trending and loyalty, browser capabilities, network properties, and mobile stats. It allows you to view traffic sources, as well as benchmark your performance and even looks at the density of visitors via a map overlay. In short, while Google Analytics doesn't help you directly earn money like other affiliates listed under Affiliate Settings, it does help you track and improve your performance, leading to better Hubbing, and, if you're after it, higher earnings! 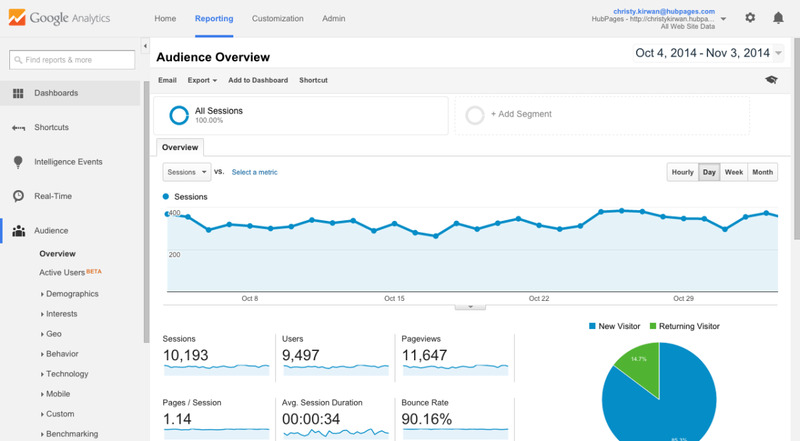 What Does Google Analytics Offer? The Content Overview section will show you a list of all of your Hubs with the number of page views and percent of page views for that Hub. If you have a large number of Hubs, you can click the View Report link for a full listing. Graphs that display the number of visitors you've experienced within a specifed timed frame. A Map Overlay showing where in the world your visitors are coming from, with the darker, highlighted areas showing where most of the visitors are from. You can click "View Report" for more details. The Traffic Source Overview shows how much traffic you have recieved from different search engines, referring websites, direct traffic, and other sources. You can click the 'View Report' link for more details about your traffic sources. This analytics information can get as detailed as you'd ever want to get and can be a very valuable way to get a even better sense of what your Hubs are up to and what types of traffic they're getting. By using some of the information that Google Analytics shows, you can continually improve your method for publishing Hubs, so don't just look at it, learn from it! Setting up Google Analytics for your Hubs is straightforward when executed from the Earnings Section of My Account. Under the Earnings section of My Account, visit the Settings tab. Scroll down to the Reporting Settings box and click the "get started" button next to Google Analytics. For a general walk-through of the signup process, read on! Visit the Analytics homepage: Visit Google Analytics. 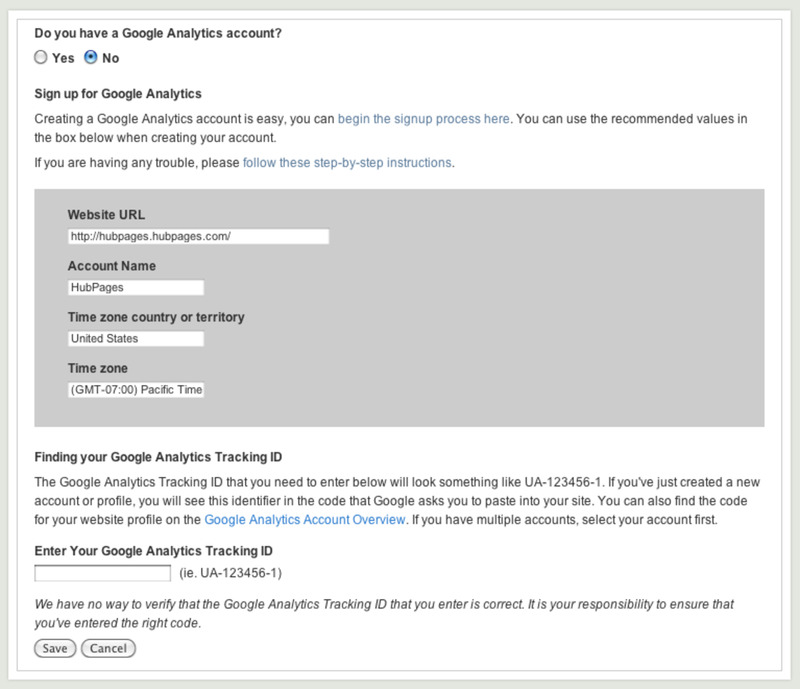 Google Analytics requires a Google Account, so if you do not have a Google Account already, you will need to create one. You can use a different time zone country or time zone if you like, but keep in mind that the data we report at HubPages is based on Pacific Time. You will also be prompted to select your data sharing settings. Select the sharing settings with which you are most comfortable. When you are finished entering this information, have read the Google Analytics Terms of Service, and agree to the terms and conditions, click the "create account" button. Copy the Tracking ID- it should look something like UA-123456-01 (Note: At the bottom of the page, there is an option to email yourself their instructions for convenient reference at a later date). Ignore the "what are you tracking" and "paste this code on your site" sections. At the bottom of the page, click "Save." Now it's time to connect this account with your HubPages account! You may notice on this page that under "Tracking Status" it says "Tracking not installed." You must proceed to My Account > Earnings > Settings > Reporting Settings and submit your Tracking ID for this action to be complete. There may be a delay of up to 48 hours after submitting the Tracking ID before your Analytics account status will change. Visit My Account > Earnings > Settings. 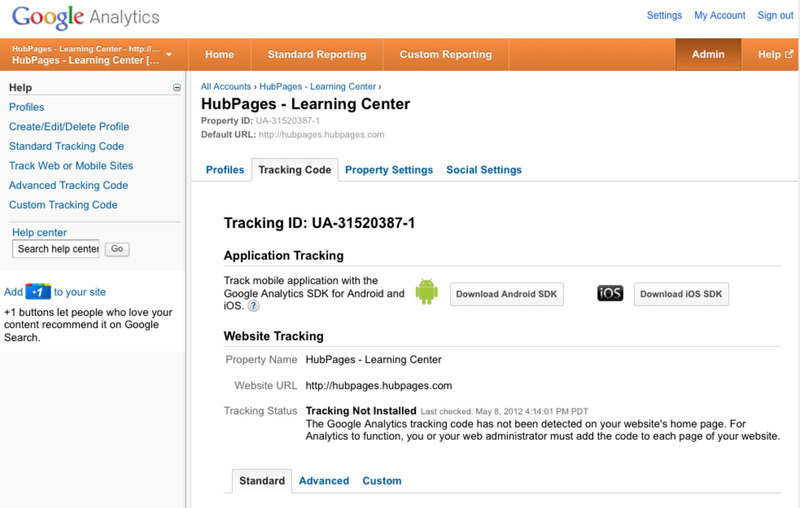 Click "get started" next to Google Analytics in the Reporting Settings section. Paste the Tracking ID into the text box. 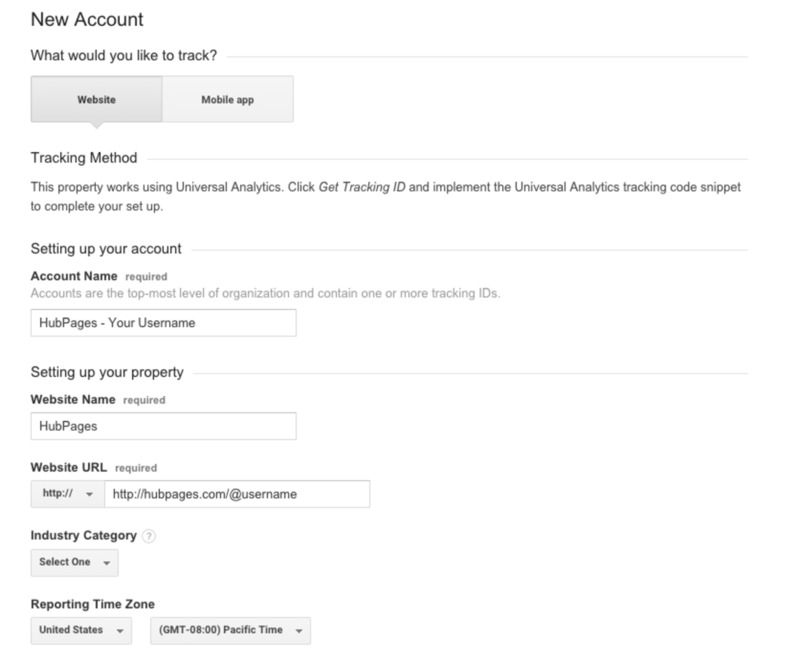 Remember, you can always go back and find the Tracking ID by visiting your Google Analytics account. Click "save." Now you're set! Google Analytics can be a very helpful tool and we hope you find it useful. Be warned that the page view and referrer data from Google Analytics is never going to match up precisely with what we report on HubPages; the method they use to collect data is different, so you should expect discrepancies.